MUNICH, Germany — I'm climbing into the 2019 Audi RS 5 Sportback for the first time, an occasion that's more notable than it might seem. Not only is my Navarra Blue metallic tester one of only seven units built in Ingolstadt before the factory shut down for Germany's August holiday, our small group of American journalists is about to blast across the Autobahn months ahead of the non-U.S. motoring press. 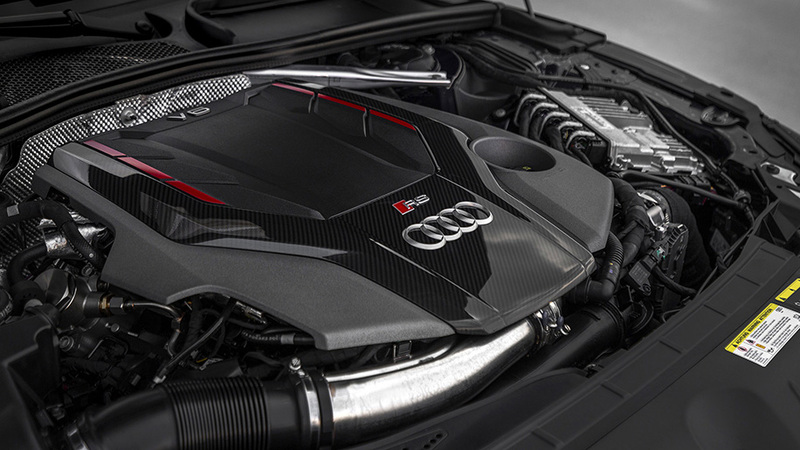 While Audi will likely sell a gajillion more Q5s than RS 5 Sportbacks stateside, this latest high-performance variant was conceived with a particular focus towards the American audience. This isn't a massaged humpback whale masquerading as a high-performance machine, but rather a stretched, expanded, and steroidal vision of a similarly functional conveyance. 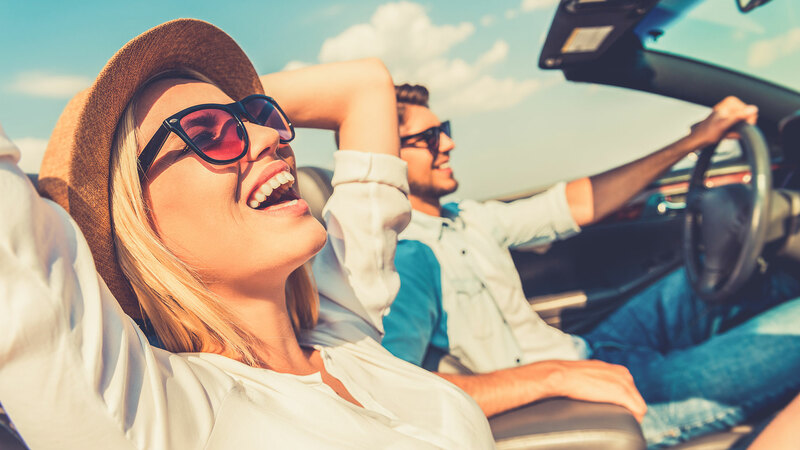 Drivers: Fold those rear seats, load up the trunk, and fire up the engine. 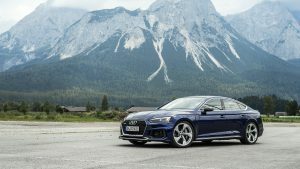 The RS 5 Sportback is the top tier counterpart to the performance-oriented S5 Sportback ($55,375) and the milder A5Sportback ($43,575). Underscoring its familial relationship to the 2019 RS 5 coupé, the Sportback shares the model's $76,190 starting price — higher than the 2018s, but with more standard equipment. But the Sportback's usability factor is significantly higher than the coupe's. With a 2.3 inch-longer wheelbase and a roof that sits 1.1 inches higher, the changes made from A-pillar back transform it into an entirely more practical proposition. Gone are the cramped rear seats, replaced with roomier accommodations that deliver 2.4 inches greater legroom, 0.9 inches more headroom, and 21.8 cubic feet of cargo capacity – nearly double that of the coupé. Fold the seats down, and you get a compact crossover-like 35 cubic feet of stowage. The price of the more spacious packaging? 88 pounds of extra mass and a 3.8 second 0 to 60 mph time, a tenth of a second behind the coupé. 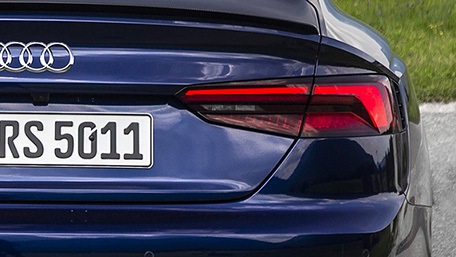 The Sportback's 2.9-liter twin-turbo V6 produces the same 444 horsepower and 443 pound-feet of torque as the coupé, but more of the mill's low frequency notes make their way into the cabin thanks to the spacious tail section. Set the drive mode to Dynamic, and the sound symposer, which consists of a diaphragm that transmits vibrations through the windshield, creates a convincing (but sometimes too-boomy) bass note throughout the cockpit. Gone are the days of Audi's lusciously sonorous RS V8s, and there's no doubt the contemporary alternative sounds a bit two-dimensional in comparison. But the benefit of modern turbocharging is torque, specifically a lovely plateau that stretches all the way from a paltry 1,900 to 5,000 rpm, and of course the improved fuel efficiency of forced induction. 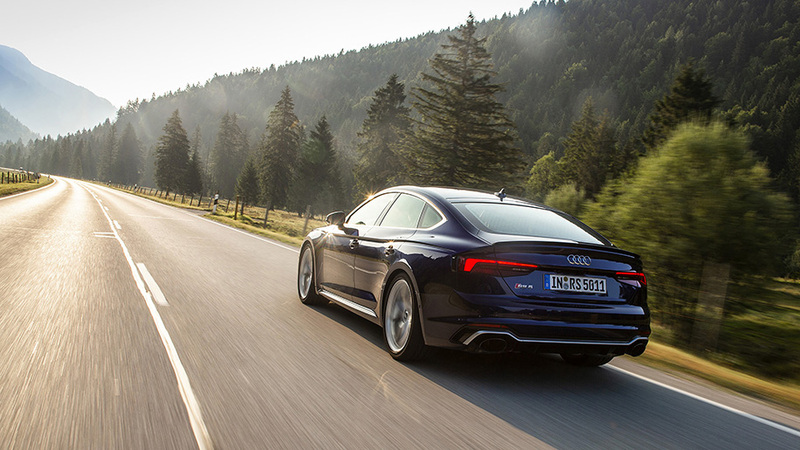 The Sportback launches ahead with strong, drama-free acceleration. 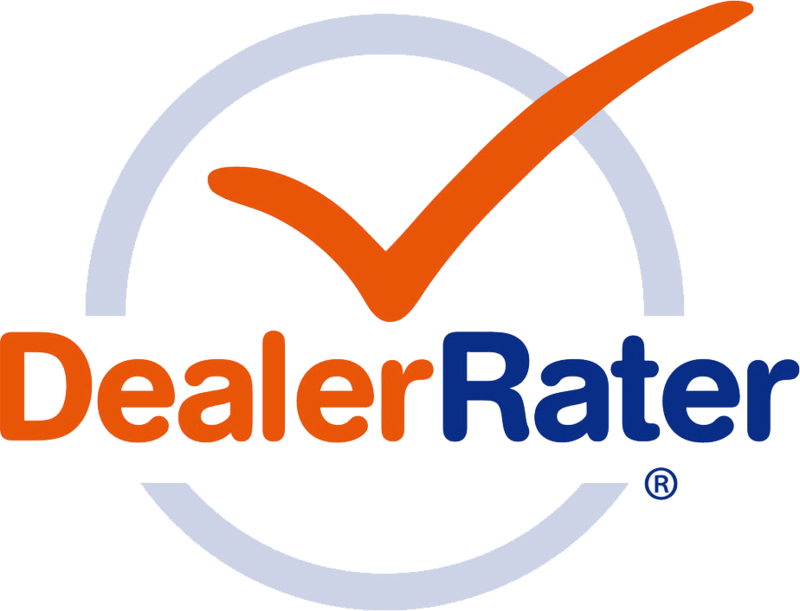 The Quattro all-wheel drive system, which defaults to a 40/60 torque split, can bias as much as 85 percent of torque to the rear, helping propel the two-ton hatchback forward with minimal wheelspin. My car's Hankook Ventus S1 Evo 2 rubber handled longitudinal forces well, lurching forward with nary a protest as the 275mm rubber hooked up with the nice, warm pavement below. Hard cornering produces some initial tire scrub that gives way to understeer before the chassis settles into stable, neutral attitude. 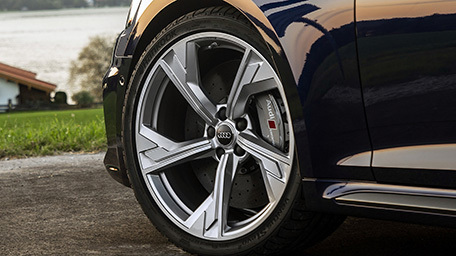 Aiding the proceedings are Audi's torque-vectoring rear differential and the front brakes — in our case, the optional carbon ceramic stoppers, which pair with steel rotors at the rear. Guide the Sportback through wide sweepers, and it satisfies with confidence bolstering surefootedness. 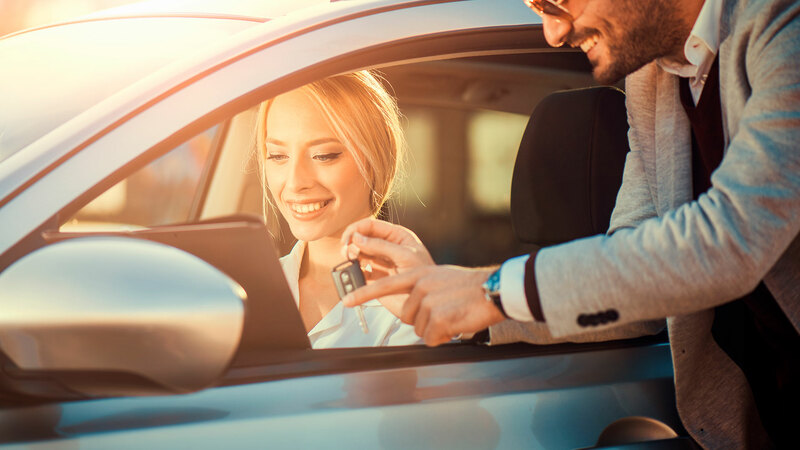 While the steering doesn't convey a whole lot of information, a bit more playfulness can be accessed through throttle modulation and weight transfer, which is communicated clearly through the chassis. Our half-day visit to Audi Sport headquarters in Neuburg, where Audi runs their GT3, GT4 and TCR racing programs, was even more illuminating. 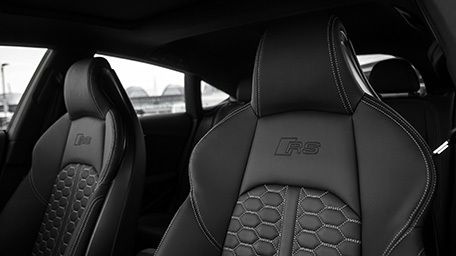 The test tracks are also used for customer driving experience courses, and we experienced the RS 5 Sportback's stable, surefooted handling characteristics on a series of wet track configurations. Because we had another full day and a half of driving ahead in our Sportbacks, Audi opted to save our tires by lending us RS5 coupés for the road course laps. Even with its shorter wheelbase and 88 fewer pounds of body fat, the coupé feels predictable but somewhat heavy in the corners, requiring a bit of preparation and planning when entering corners hot. 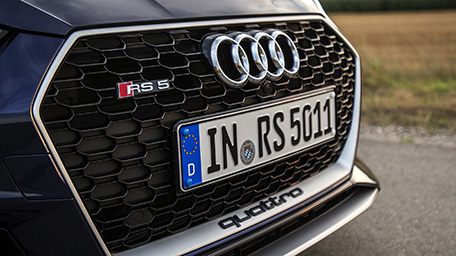 Remain patient with entry speeds, and the RS 5 rewards with poise and ample power. Go in over your head, and you'll most certainly feel the wrath of the coupé's tonnage as it barrels through the corner, though judicious inputs make it possible to recover from boneheaded maneuvers. It's here at the razor's edge where the turbocharger's double-edged sword becomes apparent: The brief spooling process can require a bit of attentiveness when adjusting the throttle mid-corner. It's not that the turbo lag is so massive, it's just that the relationship between throttle input and engine output can sometimes be crucial milliseconds apart, demanding a delicately calibrated right foot pedal. Autocross enthusiasts should also note that optimal setting, when equipped with the available dynamic steering, is Dynamic, which fixes the steering ratio. Other driving modes adjust the ratio on the fly, which makes it harder to maintain a tight leash on the RS5's precise trajectory. 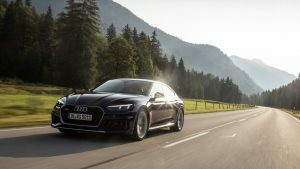 Back on the German Autobahn, the RS5 feels comfortable cruising at low triple digit speeds, offering a softened edge to the experience with its comfy massaging Napa leather seats and niceties like the Google Earth display on Audi's virtual cockpit screen. 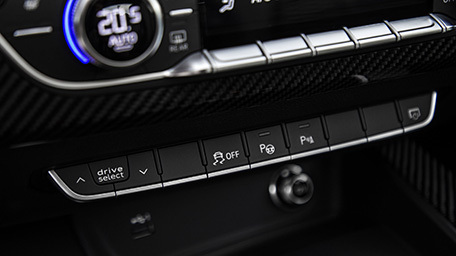 Also appreciated is the RS5's adherence to physical switches and knobs in an age when many automakers (including Audi themselves) are moving to a primarily touchscreen-based setup, which can be frustrating to use at speed or on bumpy roads. Equipped with the Dynamic Plus package, which raises top speed from 155 mph to 174 mph, my test car pulled hard through its first seven gears, winding out at an indicated (and probably optimistic) 175 mph before I had to slow for traffic. 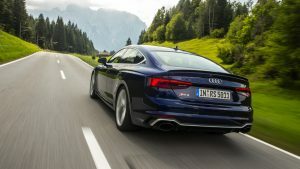 While more stability and steering directness would have been preferable at those elevated velocities, it's also important to contextualize the RS5 Sportback against its target audience: The average owner is likelier to be whipping this sedan through urban landscapes and possibly the odd winding road than Vmaxing it on the Autobahn. (Remember, it was developed with an eye toward American customers.) 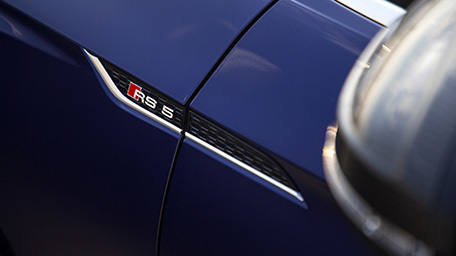 It's not that the RS 5 is such a fish out of water as it approaches the 170 mph mark — which was approached multiple times — but rather the fact that, at the end of the day, the RS 5 Sportback is a $75,000 sports sedan, not a six-figure übersled built to compete with the upper ends of the Panamera, 7-Series, and S-Class lineup. 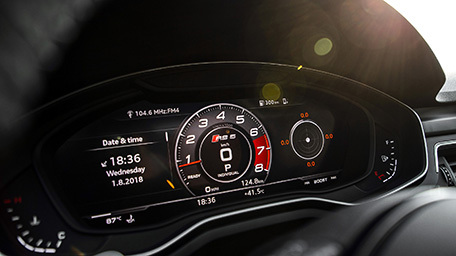 Though the outer edges of its performance might not be razor sharp enough to inspire weekend track day excursions, the genius of the Audi RS 5 Sportback lies in its layout. While its Mercedes-AMG and BMW M car competition undercut its considerable 4,057-pound curb weight, the RS 5 Sportback's spacious interior and generous cargo capacity — enough to swallow five golf bags — makes it an intriguing proposition for real-world usage. It'll handle an impromptu stoplight drag as well as an urban time attack run to the hardware store, and once there it'll easily swallow plus-sized cargo. It may not be the stuff of your deepest darkest ALMS fantasies, but the RS 5 Sportback proves versatile and involving enough to satisfy all but the pickiest of real-world driving enthusiasts. There are currently no comments for 2019 Audi RS 5 Sportback First Drive Review | Real-world speed, unworldly utility.